Editor/Author Whitbourne, Susan Krauss and Sliwinski, Martin J. 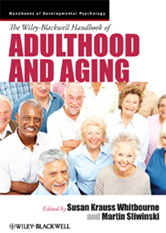 This exceptional collection draws on the most recent demographic data and combines classic research with cutting-edge approaches to provide an invaluable overview of the developmental psychology of the adult years.Covers a wide range of topics within adult development and aging, from theoretical perspectives to specific content areas. Includes newly commissioned essays from the top researchers in the field. Takes a biopsychosocial perspective, covering the biological, psychological and social changes that occur in adulthood.